Tonight, USA Network will air the final episode of season three of the Shooter TV show. The cable channel cancelled the series last month but, do you think this should be the end of the road? Would you watch a fourth season Shooter on another channel? An action drama, Shooter stars Ryan Phillippe, Omar Epps, Shantel VanSanten, Cynthia Addai-Robinson, and Jesse Bradford. Based on Stephen Hunter’s novel, Point of Impact, and the 2007 Mark Wahlberg film, Shooter centers on expert marksman Bob Lee Swagger (Phillippe). Despite being retired and living in exile, Swagger is coaxed back into action for the most important mission of his lifetime. In the third season, he discovers details surrounding his father’s death, which lead to uncovering a shocking conspiracy. Back in November 2016, the series premiered to a 0.50 rating in the 18-49 demographic with 1.44 million viewers. The first season of 10 episodes remained pretty consistent and averaged a 0.48 in the demo with 1.45 million. That was a solid performance for a USA Network series. 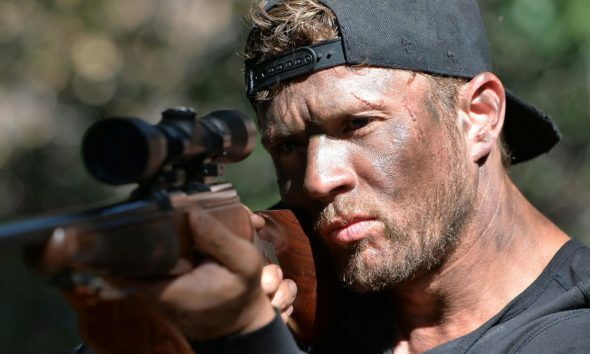 Season two of Shooter, which launched in July 2017 and had eight installments, lost a good portion of the audience. It averaged a 0.35 in the demo and 1.25 million. Compared to the first season, that was down by 28% and 14%. Season two finished airing in September 2017 and a renewal wouldn’t be announced until December. Interestingly, USA decided to order 13 episodes this time around — the show’s longest season. Season three debuted in June 2018 and the ratings were way down, right from the start. The numbers dwindled lower and lower. It’s currently averaging a 0.19 demo rating with 726,000 viewers. That’s down by 47% in the demo and down by 42% in viewers. In August, it was revealed that USA had cancelled the Shooter TV series and wouldn’t be ordering a fourth season. Word was that Paramount Television, which produces the series, planned to try to find a new home for the show. Given the decline in ratings, that doesn’t seem very likely but they could decide to move it to the Paramount Network (formerly SpikeTV). What do you think? Should Shooter be saved and renewed for a fourth season? Would you watch season four on another channel like Paramount Network? Or, should season three end the series? More about: Shooter, Shooter: canceled or renewed?, USA Network TV shows: canceled or renewed? I have been hoping this great show return at another network. Shooter is to awesome to be left on a shelf.